How are you all doing? I’m back with another fashion post today. In India, celebrities inspire our lives in very monumental ways. We want to look like them, dress like them, and take inspiration from them all the time. One such celebrity who has become an icon of young fashion is Alia Bhatt. She has brought a whole new dimension to dressing your age, and dressing different. Here are seven fashion inspirations we can take from this fiery pataka guddi. Whether it’s a white shirt tucked into a brocade lehenga, or a fun crop top with maang tika, Alia shows us that Bolly stars can do ethnic way better than chiffon sarees with blow dried hair. Therefore, all you beauties, young and old, take a leaf out of her book and make the ethnic game an all new fun one. We’ve seen how certain celebrities stick to either straight hair or curled hair while certain runway styles are too impractical to impersonate in real life. Alia, on the other hand, shows you that your hair need not have the same old boring style every day. 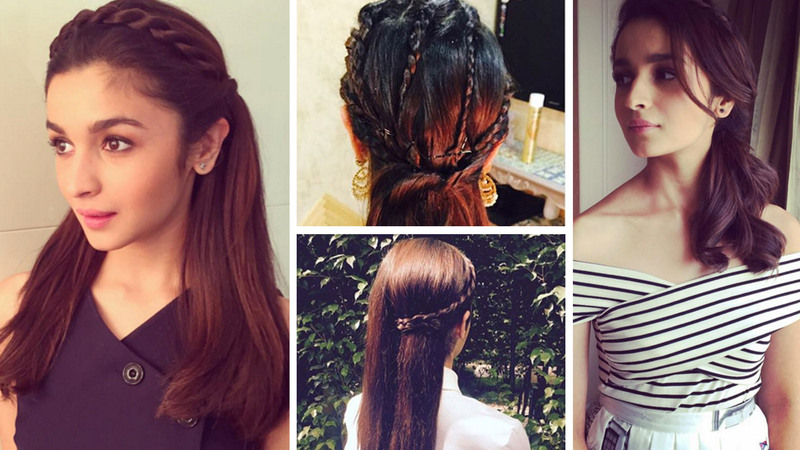 Twists and ponies, and a variety of braids – don’t be shy to play with your hair, take inspiration from this beauty and up your fashion quotient by a lot of points. Too busy to dress up or need to go somewhere in a short time crunch? Worry no more! Because Alia will show you how you can steal the show in a simple tee and denims. From promotions to airport, she shows that you need not be overdressed to be stylish. You can turn heads with a pair of denims or shorts, blow dried hair, lip gloss and of course a gorgeous smile. When the rest of the world was doing stripes or monochrome, Alia upped the quirk factor by going for prints that were completely outlandish. Result: we had some of the most gorgeous dresses and outfits ever. So if you ever feel too bored with your wardrobe, try and spice it up with super quirky prints and motifs and see how you go from drab to fab. Co-ords are the new trend in town and Alia Bhatt shows you how you can absolutely rock this trend. Be it co-ordinated skirt and top, or shorts and cropped top, or an androgynous pant suit, all you need to rock this trend is confidence, panache, and a whole lot of smiles. Brunch date, lunch date, summer outing, if fun, flirty and girly is your style, take a cue from Alia. Alia loves dresses, and we love her in them. Her top tips: keep it short, keep it fun, keep it colourful and of course keep it very happy. The biggest takeaway trend from Alia Bhatt is her ability to add little elements of surprise to her outfits. These elements amp up her fashion game and bring a cute, feminine and young charm to her dressing. A clutch saying ‘happy’, dragonfly brooches, or quirky earrings-these are the elements of surprise that completely set her apart. 10 Reasons Why Rati is The Most Glamorous Fashionista We Can’t Help Falling in Love with!